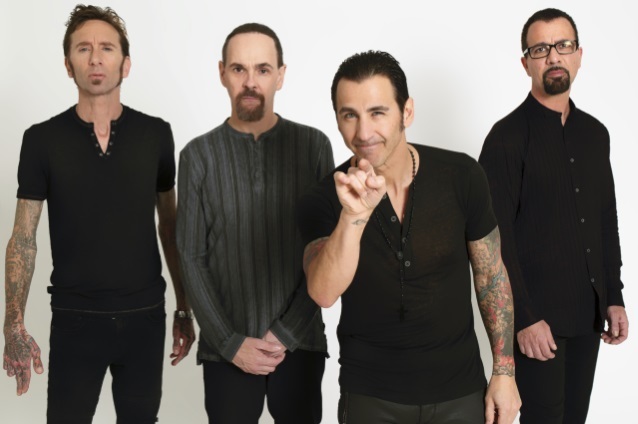 Backstage Axxess recently conducted an interview with GODSMACK drummer Shannon Larkin. You can now listen to the chat below. A couple of excerpts follow (transcribed by BLABBERMOUTH.NET). Shannon: "Turning 50 — all of us are 50 now — is probably a big part of it. We're not as angry and full of piss and vinegar as we were 10 years ago. And also, fans aren't stupid. We don't wanna be up there trying to [be] something we're not, because it'll just seem false. And again, I think that fans recognize whether a band's real or not. So with the more mature sound, a lot more melody on this one, I think the main part that's different, really, is the production. I think we still have the essence that is GODSMACK and the toughness of the riffs and stuff. But the production, certainly, is more polished sounding and we think more mature, and we can stand on stage and represent that without feeling like we're trying to act like we're still kids." Shannon: "Well, it definitely affected it hugely. As musicians with such a long career, you don't wanna keep making the same records over and over again. And also, we wear our influences on our sleeve and we're fans first and foremost — we always have been — so we watched a lot of the greatest bands starting to work with outside writers in giving them a more polished sound so that they can be true to themselves as far as their age and where they're at in music. Newer metal and hard rock bands, like AVENGED SEVENFOLD, for instance — those guys are all at least 10 years younger than us, and they play very heavy, very angry music, and they do it great. But the thing is we don't want to try and compete with these bands that are coming up, acting like… faking like we're still angry when, really, we're in such a great place in our careers that it's hard to walk around with a scowl anymore. Hence, we finally did a comedic video [for 'Bulletproof'], which we'd never attempted [before]. So we're trying to lighten up but still keep our street toughness of the riffs, of the sound of the band. No matter who writes the song, it all comes down to, 'Is it a good song or is it a bad song?' And so we really had to crush our egos on this one and say, 'Look, let's just try and do what feels natural, and if it means bringing in outside writers to help us achieve a more melodic sound so that we can feel like we're not fakers up here, then let's do it.' And so it all started with an idea. Sully [Erna, GODSMACK frontman] had the idea. He's our leader; we follow him and trust him. And so he went out to L.A. and he wrote a couple of songs with Erik and with John Feldmann. And when he came back… Tony [Rombola, guitar] and I live down here in Florida, as well as Robbie [Merrill, bass]. And so Sully flew down with some songs. The first one he played for us was 'Bulletproof', and the form it was in was demo form, so it had a drum machine. And so when we first heard it, it was, boom, it was there. We were, like, 'Oh my God! This is great. But let's see what we do to it.' And so we picked up our gear and started playing this thing, with the real drums and our tone, and it just sounded, we felt, like a natural progression of where the band should go, looking at the future and how we represent ourselves." GODSMACK and SHINEDOWN recently unveiled a second North American leg to their upcoming co-headlining tour, adding a string of fall dates to the two bands' itineraries after initially hitting the road together in July. The new dates begin on September 21 in Greenville, South Carolina, ending for now on October 11 in Portland, Oregon. ASKING ALEXANDRIA will take over in the opening slot for LIKE A STORM and RED SUN RISING, who are splitting the summer concerts.